Year 2009 indeed was a very memorable and active year for me both in my professional and personal life. I am happy about the outcome as this year has given me a sense of accomplishment in both worlds. This year, I can say that I managed to balance work and play. I was able to focus in achieving some of my key goals and objectives. As a result, I got two promotions at work and I was able to finish a full marathon this year, and I lost 11 lbs. In 2008, I was not able to focus on my fitness activity, I was on and off in the gym and don’t have a clear focus and discipline to pursue it. This year, I was able to focus on two activities – biking and running. I started to ride again in February and used that as my main fitness activity. 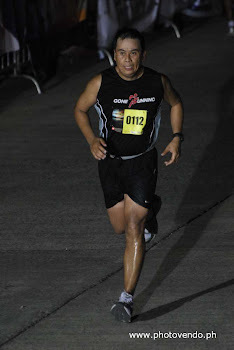 In March, I joined the Condura Run, which was my first official race doing a 10k run. From then on I enjoyed running and included that in my fitness regimen. I run at least 4 times a week, and rode every Saturday. My total mileage for running was 646.21 km and 1035.30 km for biking. Too many injuries for me this year and both knees had it. I have learned from my mistakes, and hopefully, I stay injury free next year. A lot of “My First” this year, that was joining the following distances in running: 10k, 21k, 42k, and joining one MTB race. Together with my friends, we created the Gone Running Club, we thought of putting up one so that we can all motivate each other to continue what we started. We ended the year with a total mileage of 10,178.73 km. I am grateful with all the friends I met in running, I was surprised to learn that it was a big community already here in the Philippines. Thanks to Takbo.ph people who were very supportive to all of us who were new to running. I learned a lot from their experiences which they have written in their blogs and that also encouraged me to create my own blog site. I was able to make friends with some of their members, and hopefully I meet more of them in the future runs. Thanks again. 1. To achieve a sub 50 for a 10k run. 2. To achieve a sub 2 hrs for a 21k run. 3. To achieve a sub 4:30 hours for a 42k run. 4. To do my first duathlon. 5. To lose 16 lbs. 6. and to stay injury-free. Most of this are aggressive goals for me, I just hope I can keep up with it. This year was a start of my fitness journey and both running and biking has become a way of life. I hope to continue this and that I may be able to share my experiences to everyone and encourage others to start living a healthy life. Happy New Year to all and God Bless you!